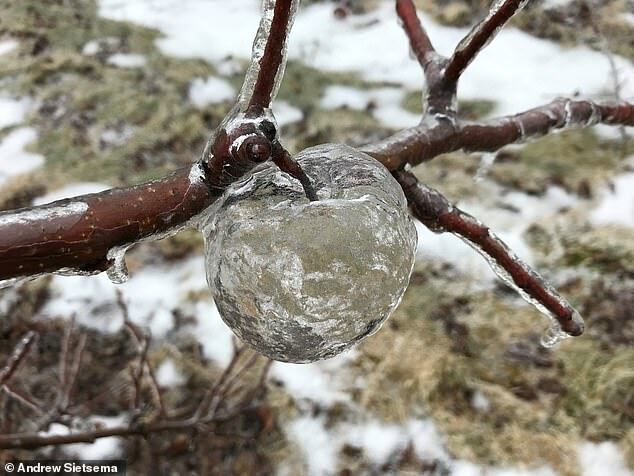 A Michigan farmer discovered this “Ice Apple” hanging in his orchard this morning. - No punchline… Just thought it was a cool picture!! This Valentine’s Day Hooters is offering free boneless chicken wings to single people who bring in a picture of their ex. - Chicken Wings? Wouldn’t Chicken BREASTS be more appropriate?? A newly released year-old video shows convicted Mexican drug lord El Chapo crying like a baby when he found out he would be tried in the U.S.
- It’s nothin compared to how he’s gonna cry during the “Spring Fling” at the Federal Prison. A study in the JAMA Journal of Medicine found that eating “ultra-processed foods” like cookies will accelerate your risk of early death. - On the bright side, if you eat “Thin Mints” you’ll look terrific at your funeral. A group of Houston teenagers discovered a TIGER inside a vacant house after they went inside to smoke some weed. - Fortunately, they got out of the house before the Tiger got the munchies. Amazon has released a documentary that claims to have discovered proof that the Noah’s Ark story in the Bible is true. - If you order it, just like Noah’s Ark, the film comes with Two DVDs and Two Videotapes.